I'm excited to be featured on Sabra Sasson's "Coffee Break with Sabra!" For this interview, we chatted about what it takes to get a renovation project started in New York City, and how having an architect along for the ride can really be an asset. Check out what we have to say! SS: Welcome to The Coffee Break with Sabra where we answer your burning questions, the questions you didn’t ask, didn’t know to ask or were afraid to ask. We ask them for you. Each week, we bring you another 20 minutes, so that you can get your answers and get back to having a productive and fabulous day. Today, we are here with Anjie Cho. 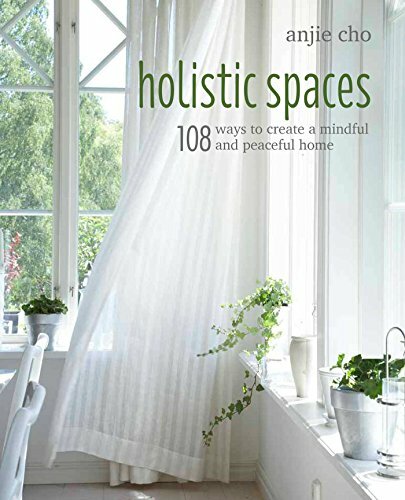 She is the bestselling author of 108 Ways to Create Holistic Spaces, Feng Shui and Green Design for Healing and Organic Homes. Anjie is an architect for clients such as Satya Jewelry and is a sought after expert in the fields of Feng Shui and Green Living. Anjie Cho is a registered architect and certified Feng Shui consultant. As a graduate in architecture from the College of Environmental Design at the University of California Berkeley, she’s been creating beautiful and nourishing environments since 1999. And today, she’ll be speaking with us about how to get started renovating your New York City apartments. Welcome to the program Anjie. AC: Hi Sabra! Thank you for having me. Thank you for being here. I think that this is a really fabulous topic to talk about today. I know that when people buy real estate, whether it’s a house or apartment, a lot of times they want to put a little bit of themselves into the place, their own style, maybe through decorations or the right piece of furniture or paint, but sometimes a little bit more drastic measures are taken into account, like structural changes and things like that. So I thought it might be good if you could start out with talking with us about those instances where an architect is needed and maybe point out some nuances where New York City maybe unique to other areas. Sure, of course. So I’m a licensed architect in New York City, and a lot of times when clients or perspective clients give me a call, they really want to know if they needed an architect. So in New York City, it’s a little bit unique because we have a lot of apartment renovations rather than single family homes. So if you have an apartment, this is geared towards you, and it’s not going to be as relevant if you’re talking about Brooklyn with a single family home or somewhere outside of New York City, so mostly Manhattan. So to look at whether you need an architect, generally, it really actually depends on the requirements of your condo board or your co-op board but technically, legally, New York City would want to have you file for permit with an architect for any time that you move, add or remove walls. So those are the times that you have to have an architect. Now, if you’re just painting your apartment, that you don’t need an architect for. And sometimes, if your co-op board or condo board is more lax, they may not make you file for anything, but technically, legally you’re supposed to file, does that make sense? Yeah, definitely. Can you clarify little bit more? Yes. So for instance, I do a lot of apartment combinations, so if you’re combining two apartments, it someone has an apartment and they buy the apartment next door to make a larger apartment, they want to combine them. So you would then be removing a wall and combining the apartments or a lot of times, people want to open up their kitchen to the living room now. If you take out that wall, you generally need to use an architect. There’s also another instance. If you want to move plumbing around, say if you have your kitchen sink on one wall but you want to move it under the window, most building management boards will require you to file that work with an architect. So this comes to a point, there’s a difference between a designer and architect. Now, I’m a licensed architect. That means that, just like you Sabra, like with an attorney or as a doctor, I’ve taken exams. I actually took 9 exams. I apprenticed for a number of years, 7 years actually. I have a degree in architecture and I’ve also passed all these exams in order to become a licensed professional in the State of New York. I have to do continuing education. Licensed architects are only people that actually say they’re architects and the only people that can sign off on your drawing. Well, actually, you could get a licensed engineer, a professional engineer, to sign off on your drawings too, but you need a licensed, either a PE or RA, which is a registered architect or professional engineer, to sign off on the drawings to submit to the city for you to get permit to do that work. So that’s when you need an architect. Now, with a designer, there are no certifications required or licensing required in New York for a designer. So someone could wake up tomorrow and decide they want to be a designer, but in order to the work legally, you need to find a licensed architect. So that’s really important. If you do need to do work with an architect, make sure that the person you’re working with is not misleading you and telling you that they might be an architect when they’re not. That’s really important. So it sounds like it’s essential, actually, to these projects because you need to have the sign off in order for them to what, be legal? Yes. So, for instance, most co-op boards won’t even let you do the work without a permit, so you would have to hire a separate architect, if you hired a designer, that could sign off on the project. So you would have to pay extra for another architect to do the work, if you could find an architect that will work with a designer, because usually, there’s a little bit of a conflict between those two parties as well. But I also wanted to go back and talk a little bit more about how you know you’ll need an architect. Usually what I tell my clients and perspective clients is to contact your condo or co-op board, and ask for something called the “alteration agreement.” This alteration agreement documents and outlines all the requirements required for you to do any kind of work in your building. Even it doesn’t require an architect, they generally want you to look at the alternation agreement. There might be a decorating agreement as well, if you’re just doing paint, and that tells you all the insurances that are required, and specifics they have required, the hours of work of the building and so forth. That’s also a good opportunity to open up a conversation with either the management, or maybe the super in your building, to say, “Hey, I want to just take down this wall between my kitchen and living room. Do you know if they’re going to make me submit a permit or get a permit for this?” So it’s a good way to start conversations, but it changes with each building. But like I said, technically, if you take out any walls, if you move, remove or add any walls or relocate any plumbing, you are required by the city to do the work, but not all buildings will require that. Some buildings will let you get away with it without getting a permit. The only danger is that, say a neighbor wants to complain, and you don’t have a permit, they can complain. They can ask the DOB, the Department of Buildings, to come and do an inspection, and then you would have to stop work and you would be fined and then you would have to file the work. So your project can be interrupted if a neighbor complains and you don’t have the proper permit is what you’re saying? Correct. All work would cease, and you would have to resolve all the issues before you could continue the work. Interesting. Wow! That would be such a pain. Yeah. Actually I was working on a project one time where this happened not because they didn’t have a permit…They did have a permit, but they didn’t have the right documentation onsite. You’re required to have the approved plans onsite and, for some reason, an inspector came by the building to visit another site. He stopped by this job site, and the contractor could not find the approved plan so he shut down the building and that was terrible. I literally had to wait outside for the inspector to come back the next day. I waited the whole day. He kept telling me “I’m coming.” He ended up coming like 4:45. I waited the whole day for him to open up the job again. Wow, wow. So it really could cost a lot of money if you don’t have the right paperwork and the right documents in place and complying with that rule of having the plans on the premises where doing the work. Wow. So how does one go about finding or selecting an architect or someone to manage the project? Well, my suggestion is to always ask first around. Just like for a doctor or a dentist or an attorney, ask for referrals. Talk to your friends or anyone that’s done a renovation recently and ask around. You can also when you ask your management for the alteration agreement, ask them, “Are there any architects that you like working with in the building?” That’s going to give you a little bit of an edge, and they’ll be familiar at the space. Of course, I’m an architect and I’m also available too. Once you’ve got 1 or 2 or, 3 maybe, that you’re looking at, I would give them a call and talk to them. Tell them about your project and see what their availability is. Number one, see if you get along with them, because you’re going to be working closely with this person, and I get a lot of people who ask me, “How much is this going to cost?” You have to understand, it’s hard for an architect to give you an estimate on their work if you don’t know what work you’re doing. So be clear about what scope you want, how much involvement you want with your architect, and talk to them too. An architect could hand hold you through the whole process, or they could be more hands off and just help you with the design or help you get the filing done. So really be clear about how much you want, and also be clear about your budget. Tell them what your budget is for construction, because that’s going to give them a good estimate on what their fees are. Generally, I think architects in New York charge between 10% and 20% of your construction cost, but that depends on how much hand holding you need during the process. An architect could come to your job site every week and check everything out, or they could not come at all, and you could just take over. So be clear about or think about your options on how much you want. What’s your budget? Think about if you can afford an architect and how much hand holding and involvement you want from them. So let me ask you, so in terms of the architect role, it sounds like there can be a wide range of what the responsibilities are for the architect, and it sounds like it also could be more than just helping with the design of the project, as you called it. Yes. If I was going to do a full service contract with someone, how we would start is we would do a conceptual design together, where I would meet with them and talk to them about their needs, look at how they live, what their requirements are, what their budget is and their scheduling is. Then we can walk through some conceptual design ideas. For instance, I just finished an apartment combination a few months ago, and with this client, we did a full service contract. So we sat down for a few meetings and found trace paper and pens and paper and really looked at her options on how to lay out the space. Tthen I proceeded with putting together what’s required for the permit drawings to get that started, because the process with the DOB takes 4 – 6 weeks, not including the time it takes to get all the signatures from management and so forth. So we got that started, and then I helped her select contractors. So we picked 3 contractors where we did a walkthrough with a good set of bid documents, which is really important too, because as an architect can provide you with bid documents, which is a set of drawings that outlines the scope of work graphically and with text. So when you walk through with the contractor without an architect, what happens is that each contractor will say, “Well, what about this, what about this, what about this?” They’re trying to be helpful. So at the end of the day, you end up with prices from three different contractors, and they’re not pricing the same thing because 1, the conversation may have change with each visit, because they have different suggestions. Number two, there are no documents stating what is the scope of work that clearly states that these are the things you’re going to purchase. You may be thinking you want to get this really cool door, but they’re going to price the cheapest things, because when they competitively bid something, they’re going to price the most competitively priced item. So at the end of the day, the price can be like a moving target. An architect can help you get a firm price. For the most part, all of my projects, we bid it out, devise some of the drawings and competitively bid it out. We include my drawings as part of the contract document, and there are almost never any change orders, which is a change in price, so you know what you’re getting into. And then other things that I could do is, like I said, I could do a weekly site visit where I work with the contractor to work out any design problems that occur or design issues that occur during the project. I also can help the client design the kitchen, help them layout the kitchen, bathrooms, floor tiles, what to look for. There’s so many things I can do, and then I also review payment requisitions too. You don’t want to really pay a contractor for more than what they’ve done in the case if they go out of business. You want to be able to walk away from a general contractor and still finish your work without losing any money. So I review payment requisitions and make sure that you’re good to pay it without overpaying. Because a lot of people like clients end up thinking, “Oh, we’re done,” and then they pay them all the money, but then there are punch list things, which are little small items that the contractors fix, but if you pay them all their money, they have no incentive to come back. So I advise on payment, I advise on what needs to be done, what’s typical, what’s not typical, there’s a lot, and we end up really actually saving the owners money. Wow. That sounds amazing. All of this that you’ve described, you gave such really wonderful advice, because, you know the expression, you’ve got to compare apples to apples and oranges to oranges. You just gave the whole example. If you’re bringing in several contractors then the conversation changes. They’re not really comparing Project X to Project X. They’re comparing Project X, which has now been tweaked by the contractor, so that’s an amazing service that you offer to help people to understand what they’re actually getting a quote for to make sure that it’s all for the same project. Exactly. At the bare minimum, I always, almost every client that I work with, I at least do the bid documents for them to make sure that they get an apples to apples comparison between the contractors, as well as my opinion on the contractor and my advice. Also, like I said, those documents, those bid document drawings go in as part of the contract documents in the contract that you sign with the GC, and in my drawings, I have a lot of notes, general notes, that cover things like, for instance, you may think you’re going to get your paint included, but then they say, “We only included that you get the ready-mix white paint.” So you think, “No, I don’t want to pay extra to get blue paint.” Little things like that. Also defining, “You need primer, plus 2 coats of Benjamin Moore paint in something other than ready-mix colors.” Things like that, that I know about, but the average home owner won’t know about. So this way you can cover yourself, make sure you get the best products. The architect really is a client’s rep, so we watch out for the client. That’s awesome. In terms of these projects, if somebody wants to make a renovation, how would you say is the first step? Is the first step looking at the alteration agreement and then looking for an architect, if it’s necessary or required by the board? Where would somebody start? What would be the first step? I think the first step would be to talk to your board or talk to your management or your super. If you’re close with your super in the building and he’s very involved, just ask the super, because he usually knows everything that’s going on. Let them know, “Oh, we’re thinking of doing a little bit of work,” and ask him what he thinks the process is for you, and then you can always reach out to your management and get the alteration agreement. Then ask around for architects and find a few that you want to reach out to, and give them a call or email them, and just talk to them on the phone. You could send them a plan, if you have a plan of your apartment, and just start a conversation going. Fantastic. So I wanted to just quickly ask if you could tell our listeners how they can reach you if they have any questions about their upcoming projects and if you have any final words for us. Well, you can reach me through my website. It’s www.anjiecho.com, and that’s spelled A – N – J – I – E – C – H – O.com, and any perspective clients can always call me directly. My phone number is on the website, or email me directly. That’s another thing that you should look at with the architect, too. You might want to see if you’re actually going to be talking to the architect throughout the process or if they have a bigger firm and you’re going to be talking to a project manager or someone lower level. I know, I basically do all the design, and I have freelancers and some staff and interns that help me, but I am the one designing. I’m the one who’s contacting the client all the time, and I also am available. I always respond within 24 hours, and that’s something that you should ask. How long will it take you to respond to emails, and will I be working with you? Maybe you don’t mind if you’re working with a project manager, or maybe you really want to work with the architect, but in any case, I’ll respond to all the emails and I’m the main contact with all my clients, so anyone can reach out to me with any questions. Fantastic. And I feel that anyone who is considering renovation in their place should definitely consider reaching out to you, because you’re very knowledgeable and you have so much experience, and you’re really great to talk to, so I think working with you would probably be really easy. That’s what my clients say. That’s another thing too! Sorry, one more thing. You can also ask the architects you talk to provide you with some references that you can call too. That’s really important. That’s a great point, probably with anybody that you work with. You might want to compare and find out what the experience was with other clients that they have worked with. Fabulous. Thank you so much Anjie. Thank you for being here. You’re welcome! Thank you so much, Sabra. It’s always so much fun. We always have so much to talk about. Yes we do. There’s always really interesting information and fascinating stories that you share. So I want to thank you again for joining us this week and join us again next week during our weekly Coffee Break with Sabra.